You can publish photographs and other images on most pages of your Envaya website, including news updates. 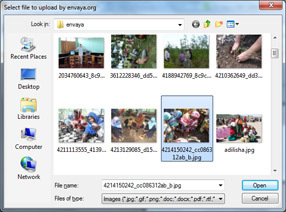 Your image will then be processed and transferred to Envaya's servers, which may take a few minutes depending on the speed of your internet connection. Next, Envaya will show a preview of your image. Click Small, Medium, or Large to choose the size of your image on the webpage, and click Left, Center, or Right to choose where the image will be placed. When you click OK, your image will be added to the page you are editing. You can then continue editing the page, add a description of the image, and even add more images to the same page. 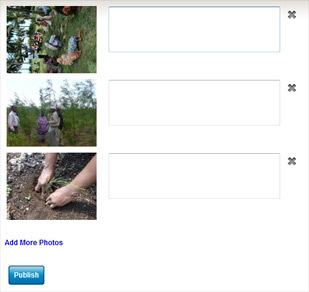 If your organization has many photographs, you can add many of them at one time using the Add Photos page. On the next page, you may see a message that says "To add photos faster, install Adobe Flash 10". If you see this message, you can still add photos, but your computer currently only supports adding one photograph at a time, and the photographs may take a long time to transfer. If you install Adobe Flash, you will be able to add many photographs at once, and they will be transferred much faster. In the window that opens, find the photos you would like to add. 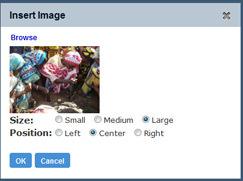 You can select many photos at once by holding down the Shift or Control key when you select the photos. Click Open when you are finished. 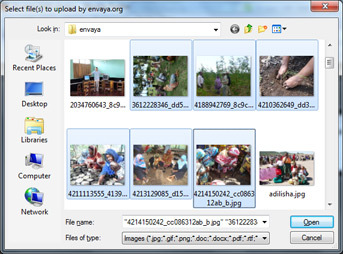 Your photos will then be processed and transferred to Envaya's servers, which may take a few minutes depending on the speed of your internet connection. When your photos are ready, you can add a description for each one. To remove a photo, click the X. When you are finished, click the Publish button at the bottom of the page to add the photos to your website.